Join us at the Neag Planetarium for an unforgettable fashion show that will feature West Reading boutiques on the runway, raffles, refreshments, and more! 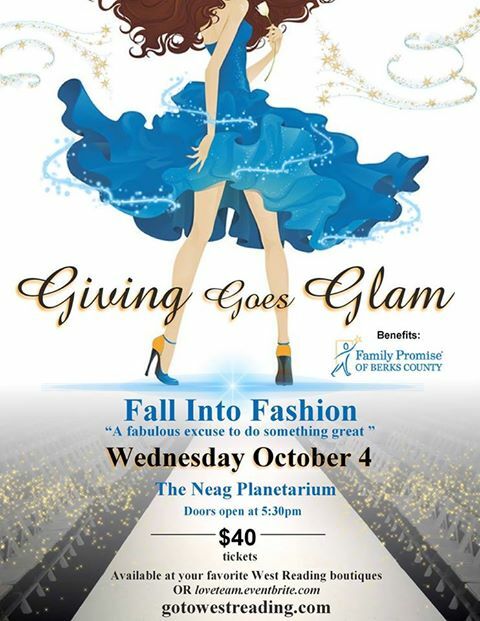 The Giving Goes Glam Fashion Show will be held at the Neag Planetarium on the grounds of the Reading Public Museum. Satisfy your palate with the many “tastes” of West Reading that will be offered before the show and try your luck to win one of the fabulous raffle prizes. Cocktail hour begins at 5:30pm with the fashion show beginning at 6:30pm.